I own three BoArduino, but I keep semi-permanently installing them in some project or the other - I guess that happens to most people? So here's a little label, you can print out, stick on to a Atmega and it will show you the pin out that match the Arduino standard. I tried printing it - but the font was a bit too light - and it needed something special. So I made my own from scratch. Wow.. Timing couldn't be better. I'm about to solder up my first standalone Arduino integrated into my first real Arduino project. This will cut down on de-soldering and head slapping I'm sure. The SVG works fine on Inkscape 0.48 on Linux. Anyone else have the same result? Make sure that the printer isn't scaling it before it prints - sometimes it will try and help you out my making sure the document fits the printed page - we don't want that in this case. It will usually be the in the printer dialog settings under "page scaling" or something. Thanks George. Printed just the right size by choosing to print the current view in the print dialog. You nailed it George. I switched "page scaling" from "Fit to page" to "none". Fits like a glove. Great idea! 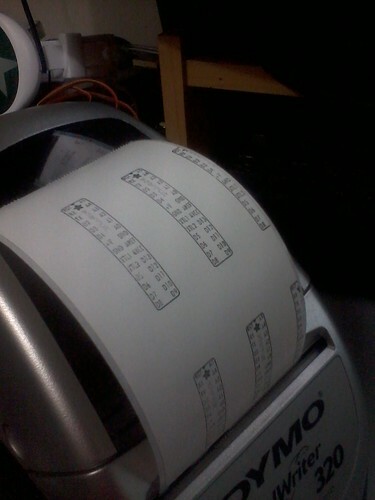 I'm going to see if I can replicate it with a P-Touch labeler. Hi and How to simulate arduino programs using virtual breadboard ?? LBX files are Brother's P-Touch software label document format. Anyway, I hope someone finds these useful. George, thanks for making the original. The provided svg ones were really slow for me. Sometimes I hate the internet! Every one of the links to sticker images on this page are dead, yet the page still lives.